Every school-age Radiohead fan knows that Thom Yorke recorded this ‘No Surprises’ B-side at home on a four-track while his partner chopped vegetables and did the washing up. Home recording, for musicians, is a commonplace idea, and more and more people seem aware that in the contemporary music industry, a lot of records are home-made or semi-home-made. But imagine what it was like back in the Jurassic era (OK, the mid-1990s): I’d been playing guitar for, I don’t know, a year or so when I read a round-up of six or eight portastudios in a guitar magazine. While even £300 for a basic Tascam 414 model was way beyond my means at 14 or 15, it was the first time I realised that a musician could make some sort of recording at home. I’d come across the term ‘lo-fi’ in a book, but I had no idea what ‘lo-fi’ sounded like, or how it was achieved. This new knowledge, that recording had been somehow democratised, came to me with the force of a revelation. As my musical tastes and knowledge widened, to include such artists as Elliott Smith and Lou Barlow, I developed a definite taste for the lo-fi. There’s a scene in the film Ray where Ray Charles and Margie Hendricks spontaneously write and perform ‘Hit the Road, Jack’ while in the middle of a furious argument. It’s the single most risible incident in a film that stretches credibility much too far much too often. But maybe that scene is true to the way non-musicians imagine that songwriters work. Maybe it isn’t that big a stretch for a general audience to believe that songs do burst fully formed into life like that. If so, perhaps what Radiohead fans treasure about this recording is that sense that they’re hearing Yorke play the song for the first time; perhaps they imagine they are hearing the moment of creation, not a moment several hours into the process when the writer has pulled the words and chords and notes into shape and taken the time to set up a microphone to record an early version of their new work. The four-track demo suggests an authentic, unproduced creative moment, when in fact a four-track recording no more spontaneously happens than a pencil sketch for an oil painting spontaneously happens. It still takes time and preparation to put a sketch down on paper, however rough the sketch. Thinking back to my adolescence, I did believe that lo-fi records were somehow more authentic – and morally purer – than high-budget, mainstream records. Certainly the lack of production options inherent in working in a DIY setting back then ensured that self-recorded songs, almost without exception, had simple arrangements and that little mistakes stayed in unless the musician could play a whole take flawlessly. So I can’t mock a Radiohead fan who feels that in How I Made My Millions they have the opportunity of being a fly on the wall during Thom Yorke’s creative process, because as a 16-year-old I believed something very similar myself. But for sure it does take a skilful and single-minded musician to drag his or her music through the modern production process without it losing something vital. Records that still contain the initial spark of inspiration are rarer nowadays, at all levels of the music industry, as some of the tools of hi-fi recording (or at least mid-fi recording) have become more widely available. 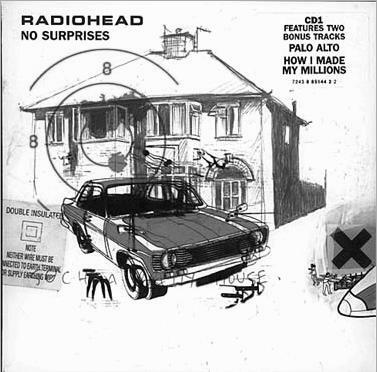 In January 1998 ‘How I Made My Millions’ gave younger Radiohead fans a taste of the vibrancy and spark that is more readily perceptible in records in the fifties, sixties and early seventies than in the rest of Radiohead’s oeuvre, and which they perhaps hadn’t heard before, and that likely explains its status as one of the most beloved of Radiohead B-sides. This entry was posted in Music and tagged flubs, home recording, lo-fi, portastudio, Radiohead, Tascam, wibble on March 21, 2013 by rossjpalmer.